When it comes to cosmetologists, all 50 states require licensing. If you want to practice in a state, you need to be licensed by that state to work. Click here to see the cosmetology license requirements in each state. Genesis Career College offers students board-approved cosmetology programs at campuses in Tennessee, Georgia and Alabama. Upon your graduation Genesis Career College will notify the State of Tennessee’s cosmetologist testing vendor, PSI Exams, that you are eligible to take the cosmetology exam. When you receive email confirmation that you are eligible to take the PSI exam, call 1-800-733-9267 or go to PSI Exams Online to pay for and schedule your written exam. Here is a link to detailed information on cosmetology licensing tests required by the state of Tennessee: Tennessee Cosmetologist Examination Candidate Information Bulletin. Print this document and read it carefully. There is a $70 fee for the written “theory” portion of the exam, which must be scheduled and taken in-person at the Tennessee PSI location of your choice: Chattanooga, Jackson, Johnson City, Knoxville, Memphis or Nashville. You will receive same-day results. If you pass, you will be able to schedule the practical (hands-on) portion of the exam ($70 fee). There are three testing centers where you take the practical part of the test: Memphis, Nashville or Knoxville. Once you have passed both the theory and practical portions of the state board examination through PSI, you will receive a notification that you have passed, along with a license application form to complete. Submit the application with a $50 license fee to receive your cosmetologist license from the State of Tennessee. It can take up to four weeks for your application to be processed and for you to receive your license. Cosmetologist licenses must be renewed every two years in Tennessee. Renewal fee is $50 and should be submitted four weeks in advance of your license expiration date. Please refer to Tennessee Board of Cosmetology, which regulates the practice of cosmetology in the state, with questions. Upon your successful completion of the Cosmetology program, Genesis Career College will send a notice of eligibility to the State of Georgia’s cosmetology testing vendor, PSI Exams. You will also be emailed an eligibility notice containing instructions for scheduling the written portion of the exam. Here is a link to detailed information on cosmetology licensing tests required by the state of Georgia: Georgia Cosmetologist Examination Candidate Information Bulletin. Print this document and read it carefully. 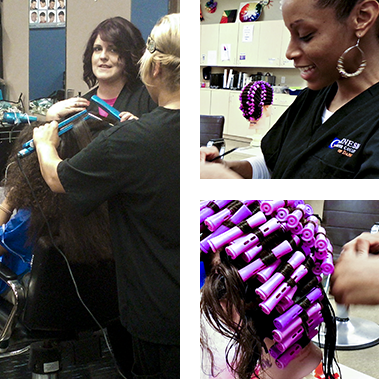 The written portion of the cosmetology exam can be taken at PSI testing locations in Atlanta, Macon and Tifton. The “practical” test can be taken at locations in Atlanta and Macon. The licensure examination fees total $109. After you have passed both the written and the practical portions of the examination administered by PSI, apply for your license from the Georgia Board of Cosmetology. Once Genesis Career College Cosmetology graduates have passed both the written and practical examinations, they can apply online for their Georgia Master Cosmetology license. If you cannot apply online, you may download a paper application. The in-state application fee is $30. Master Cosmetologists in Georgia are required to complete five hours of approved continuing education every two years in order to be able to renew their license. Details about continuing education requirements, fees and renewal procedures are found on the Georgia Board of Cosmetology website. The license renewal fee is $50. To get your license to work in Alabama, first apply for licensure with the Alabama Board of Cosmetology and Barbering – then the board gives notice to both independent test vendors that you are qualified to schedule and take the exams (both written and “practical”). Once you apply for your license with the Alabama board, you can schedule your written exam with PSI Exams Online. Here is a link explaining how to take the written cosmetology licensing test: Cosmetology Written Examination Information. Print this document and read it over. After you pass the written exam, print out and carefully review the practical examination requirements in the Candidate Handbook available here from Professional Credential Services, which will explain how to schedule and complete your practical exam, and also how to ultimately receive your license from the Alabama board. Once you complete the practical part of the test, your score will be sent to you and the Alabama board. If you pass, the board will then finish processing the application you already filed and issue your cosmetology license. The written exam costs $75, the practical costs $120 and the license fee is $40. In the state of Alabama, cosmetologists must renew their licenses every two years. Renewal fees are $80. Please refer to Alabama Board of Cosmetology and Barbering with questions.